Moogles are supporting characters in the "Final Fantasy" series of games. They are small, white creatures, with red wings, and are quite intelligent, even though they have been used as pets. "Moogle" is also a status condition in the game "Final Fantasy Adventure". When you are turned into a Moogle, you can't fight and have weakened defense. Moogles are also seen in the SNES game "Secret of Mana". In that game, you find a whole village of Moogles, and must help them. Moogles first appeared in the game "Final Fantasy 3", which was only sold in Japan. Moogles are next seen in "Final Fantasy 5", where you find a forest of them, which unfortunately is later destroyed. In "Final Fantasy 6" (FF3 in America), a Moogle named Mog joins your team. Mog fights with a spear, and has powerful dance attacks. 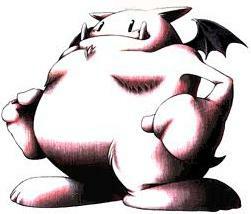 Moogles are seen in excess in "Final Fantasy 7" in various games and places, as well as one of your teammates, Cait Sith. Cait Sith isn't actually a Moogle, but a cat who magically brought a teddy bear moogle to life and rides on it. It is still unknown if Moogles will be used is "Final Fantasy 8".